On February 18th 2004 I received the first batch of the newly released Japanese cardboard sleeve cd's. Queen - Queen II - Sheer Heart Attack - A Night At The Opera - A Day At The Races - News Of The World - Jazz - The Game. The artwork is stunning and it's a complete replica of the original vinyl albums. (Gatefold) sleeves as the original ones. Even the innersleeves (of the original album) are there. Jazz has a mini fold-out bicycle poster attached to the sleeve. The cd itself has the original centre-label as on the vinyl album. The quality of the material and printing is perfect and the soundquality is awesome. If you got some money to spend - add these items to your collection! Of course EMI should release this worldwide. 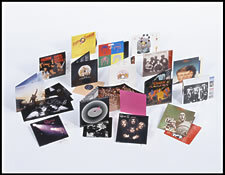 Right now (April 2004) this collection can be bought through the official Queen website. Later in 2004 I decided to also buy the 3 live albums as Japanese Cardboard cd's.